Hello! 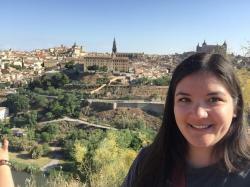 My name is Sarah and this is a quick introduction to my blog. I am a level 1 student in the Diagnostic Medical Sonography program at BCIT and very excited to be able to share my experiences with the world. This is my first blog post and I plan on sharing what I know and love about this program! 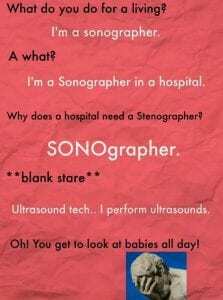 So, you may be asking, what is Sonography? Sonography or ultrasound is a tool that hospitals and clinics use to visualize the body. Ultrasound uses a high frequency sound waves to penetrate the body. 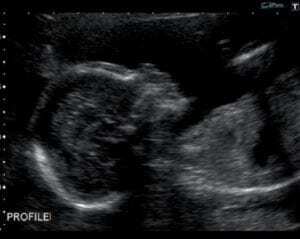 The sound that returns are recorded and displayed as an image to the Sonographer. These images are real-time and has little to no known harmful effect on the patient. Ultrasounds can be used to image blood vessels, the heart, liver, kidneys, etc. Ultrasound images made me think about Rorschach inkblot test, hopefully my interpretation of them doesn’t say anything negative about my emotional and intellectual functioning. I am not by all means an expert but I have found that very quickly, thanks to the patience of our teachers, things are starting to come together. I don’t see a kidney as a tree any more so I think I am on the right track. It is only week 3 into the program but I am already feeling that I have improved significantly since I started. Do you enjoy working with different types of people/patients? Do you want a job that has a high rate of job placements? Do you want to make great connections and friends? If you have said yes to all of these, stick around, I will have much more to share. I look forward to reading more of your blogs. Your writing is very engaging to the reader. Looking forward to your next contribution. Hello! I am going to be applying to ultrasound. I have a radiologic technology diploma that was done in Winnipeg Manitoba. Have a 3.7 gpa. Do you think I will be accepted? How much do volunteer hours matter (looking into this now). Your writing style is quite interesting, and I can’t wait to read more about your success in the program. I’m going to apply next year, and I know it’s very competitive. I have a BS in Nutritional science (finished 9 years ago) and I’m upgrading my high school lessons at the moment. I’m working in animal hospital as a vet assistant and I’m volunteering with coastal health in one of the communities (Parents & Infant Drop in). Do I have the chance to be accepted? Is it necessary to have a volunteer job in a medical imaging center? As long as you meet the requirements that they ask for and have some experience with patients you have a chance. I did not have a volunteer job in a medical imaging center, so I don’t think you have to. I currently work as an LPN at the hospital in Vancouver and was interested in transitioning to become a sonographer. I have worked as an LPN for 7 years in both nursing home and acute setting combined. A coworker of mine said that getting into this program is very competitive. Is that true? Did you have a hard time getting into the program? I haven’t been in school since I graduated so I’m a bit worried. Will your acceptance into the program be based on your grades from the prerequisites? How heavy are the courses for level 1? Thanks in advance. Yes, I think the program is competitive to get into. I think I remember someone saying they recieve 300 applicants and they only take 32. I did work hard to try to get in. I think schooling and experience are really important in getting into the program. Being an LPN, the experience you have will definitely help you. I was out of school for 6 years before coming into this program. I was pretty nervous too. It is hard work but if you put in the time you can do it! I had to take challenge exams because I had been out of school for too long. Make sure you have done and the prereqs. Hi..i already have my ARDMS Certificate but I want to get some hands on trainning.. is there anyway I can get some? You would have to be in the DMS program to scan to get hands on training. If you want more information you could contact the program about that.